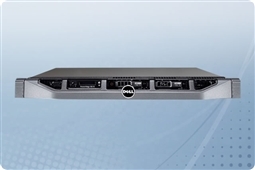 The Dell PowerEdge R220 rackmount server is a quiet and compact single-socket server that is perfect for a variety of entry-level workloads and organizations of all sizes. With a short chassis depth of 15.5” and quite, office-level acoustics, the R220 server can be deployed easily in a short-depth rack or even a countertop. When racked in a standard rack, the R220 offers ample room for cabling or connecting devices. The R220 features latest generation technology, including Intel Xeon E3-1200 v3 processor series with ample cache, up to 32GB DDR3 memory and PCIe Gen 3 for accelerated I/O. Aventis Systems carries the R220 with either 3.5” hard drives or 2.5” hard drives. Please browse our PowerEdge R220 servers below and click customize for your built-to-order configuration! Aventis Systems carries Aventis Certified Reconditioned Dell PowerEdge R220 servers. All servers from Aventis System include a 3 year Comprehensive Warranty, with eligibility for optional Express warranties and onsite services. 4TB (2 x 2TB) 7.2K 6Gb/s NL SAS 3.5"